In our second article in the series explaining electronic paper, we take a look back at the origins of e ink technology and its various applications, from e-paper’s humble beginnings in the 1970s, to the boom that was e Readers. From e-paper’s humble beginnings in the 1970s, to the boom that was eReaders, all the way to its use in battery powered and wireless digital signs, the history of electronic paper is an interesting one. Can you imagine having to use your computer in a dark room only, with the lights turned off and shades drawn, just so that you are able to see what it is you are typing into your text editor? The father of electronic paper couldn’t either, so some 40 years ago he invented a technology to replace the low-contrast screen of his company’s computer, creating the first e-paper display. From e-paper’s humble beginnings in the 1970s (covered in Part 1), to the boom that was e Readers, all the way to its use in battery powered and wireless digital signs, this is the history of electronic paper. The predecessor to electronic paper, the Gyricon, a Greek term for a rotating image, was invented in 1974 in the labs of the Xerox Palo Alto Research Center as a display that would be high-contrast enough to allow the Alto personal computer to be used in brightly lit environments. A thin layer of flexible transparent plastic, the Gyricon rotating ball display contained millions of tiny spheres suspended in bubbles of oil, similarly to electronic paper of today. The spheres had hemispheres of two contrasting colors that would rotate to present one colored side to the viewer when voltage was applied to the sheet, thus displaying on screen an image or text that would stay there until the next electric charge. E-paper beginnings: Xerox’s ‘rotary balls in a gyricon medium’ (source: Google Patent Search). Perfected through the work of E Ink and others, e-paper was now more than ready to enter the mainstream. The invention, initially intended not as a substitute to traditional paper but rather a better type of screen, had little impact outside the lecture circuit for many years. That is until 1989, when in a search for a truly paperless office Gyricon’s inventor Nicholas Sheridon started to develop his creation to mimic printed text on paper, with the added bonus that the new paper-like technology could feature pages upon pages of text that could be re-written thousands of times. This reusable and erasable electronic paper would, it was hoped, make possible the creation of inkless printers and fax machines. And others soon joined in the chase of developing of a true paper substitute. Among them were researchers at the MIT Media Lab, an interdisciplinary laboratory at the Massachusetts Institute of Technology. Founding the E Ink Corporation in 1997, they began developing what is the electronic paper of today. E Ink’s approach differed from Gyricon in that instead of the electric current rotating individual color spheres in a film, the change in the electric charge would rotate small color particles within each sphere, allowing for more refined images and better grayscale. This paved the way for the development of E Ink’s active matrix e-paper display. Introduced in 2001, the display for the first time made it possible for each of the pixels on the screen to change color, and not just certain predetermined sections of the surface, expanding the potential and versatility of e-paper’s use. 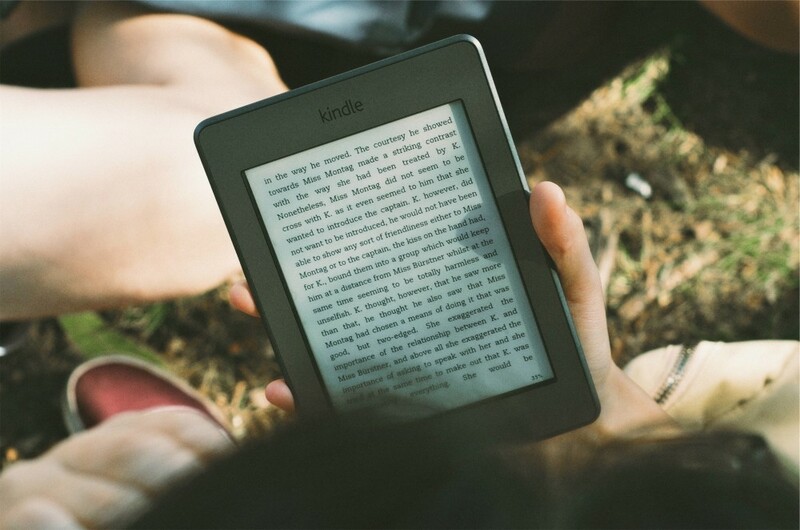 You know what we’re talking about – eReaders. And this is exactly what happened when the popularization of eReaders propelled e ink into homes and awarenesses across the globe. In 2004, Sony was the first to introduce to the market an actual digital book, the ‘Portable Reader System’ running on e-paper. The Sony Librie eReader used an electronic paper display developed by E Ink, was viewable in direct sunlight, required no power to maintain a static image, and was usable in portrait or landscape orientation. Ushering in an era of e-books and e-newspapers, Sony’s electronic reader was soon followed by Barnes & Noble, Booken, Kobo, PocketBook and of course Amazon’s Kindle, to name but a few. The use of eReaders became so widespread, that it was reported that by 2014 a whopping 50% of American owned a dedicated reading device, either an e-reader or a tablet. The awareness of electronic paper’s many advantages grew, and with it ideas on what else e ink could be capable of. Wristwatches, mobile phones, smart cards, shelf labels, traffic signs and all types of digital signage – you name it, someone was testing to see if e-paper could do it. The future of electronic paper had arrived.